As readers of my previous reports will have noted, I believe that ICSOM has an important role to play in communication: between orchestras, within the larger Federation, and with the wider world. That’s why I and the Governing Board have put a lot of our effort into improving ICSOM’s social media presence (Note: see the October 2017 issue), relaunching the conductor evaluation program (Note: see the December 2017 issue, as well as Barb Corbató’s report in this issue), and making sure that our listservs, Orchestra-l and Delegate-l, have a successful transition to a new platform (Note: see the October 2018 issue). Another important communication tool is our own website, www.icsom.org. Originally created in 1996, our website enjoyed a substantial overhaul in 2012, thanks to ICSOM webmaster Martha Warrington. I had the pleasure of meeting Martha last summer when I attended the ROPA conference in Portland (she is a violist with the Oregon Symphony). We spoke for several hours about our vision for ICSOM’s website, and the ways we could improve its usefulness to ICSOM members. I am pleased to announce that we have recently completed many improvements to ICSOM’s website, thanks to suggestions from Governing Board members and work by Martha. For starters, the home page now has a “Current News” column, which I update at the beginning of every week (since November 2018). There you will find the leading stories about ICSOM orchestras that had appeared recently at our Twitter account @ICSOM. Next, the menu’s “News” option includes a “News Archive”, which houses all of our news stories. Notice that it has been categorized by year, as well as by orchestra. Another new feature is that the “Orchestras” option on the menu contains more detailed information. 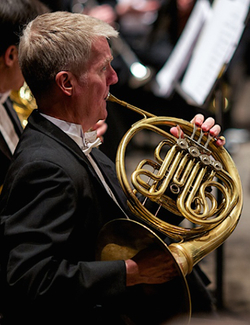 For each orchestra, links to the websites of the players’ associations are given, as well as links to their Facebook, Twitter, and Instagram accounts. The news items from the home page for that orchestra are provided here as well. A photo of each ICSOM orchestra now appears at our website. Governing Board members Dan Sweeley and Laura Ross are to be thanked for handling this project. We continue to update the “Member Services links” from the “Links” option on the main menu. As a convenience, links to items offered by ICSOM members are provided on that page (such as information about ordering Bruce Ridge’s recent book Last Year’s Words, and Next Year’s Voices, highly recommended reading for everyone, by the way). As stated there, the Member Service links are not an endorsement by ICSOM. Contact me should you have an item that you wish to have included in the Member Services links. We created room on the home page for the “Current News” column by moving the information about ICSOM that had previously appeared there to a special page for that purpose. We added an “About” option on the menu to access the new page. Why is it important for our members to visit the website? To stay informed about the news regarding ICSOM’s orchestras. All are encouraged to view our improved website to see these updates, as well as check in weekly to keep up with the current news stories. Finally, I must give a sincere thank-you to Martha Warrington for all of her dedicated work. I am pleased that those ideas we discussed in Portland have been realized, and so quickly. Thanks for all you do, Martha! Ideas of having ICSOM’s website as an improved resource for our membership evolved into action, and I am pleased to have assisted in this project. Contact me any time at AustinLPaul@gmail.com with suggestions for even more improvements. Note: the author is ICSOM President.